Braintree, MA (September 2, 2016) – Whitman resident Marcel Furtado recently completed a summer internship at full-service real estate firm Peabody Properties, Inc. Furtado, who hopes to explore a career in the real estate HVAC field, served as intern for the firm’s facilities management department. The sophomore, who is slated to graduate from Massasoit Community College in 2019 with an Associate of Applied Science degree, plans to continue his engineering studies at Massachusetts Maritime Academy. Over the course of his eight-week internship, Furtado worked with the facilities management team which oversees maintenance and repair services in the company’s 130 properties. He also shadowed the company’s HVAC managers and became familiar with each building’s cooling, ventilation and air conditioning systems. Through his internship at Peabody Properties, Furtado was able to expand his knowledge of HVAC systems and project management in both the corporate setting and at individual properties, while gaining a better understanding of the fundamentals of facilities and operations management. “Through my internship I learned that I can apply my skills to many aspects of the real estate field. I enjoyed the hands-on experiences and working side-by-side with experienced professionals,” said Furtado. Based in Braintree, Peabody Properties manages in excess of 10,000 units of housing, primarily in New England, with offices located in New Jersey and Florida. Peabody Properties’ internship program, which was launched in 2012, teaches participants all aspects of real estate management, from corporate office responsibilities to on-site property management, and partners with the Asian American Civic Association (AACA), placing their interns in maintenance technician positions throughout the company. According to Mitchelle Frederick, Company Recruiter at Peabody Properties, Furtado was able to learn valuable new skills during his time at Peabody Properties. “We all enjoyed having Marcel working with us this summer. 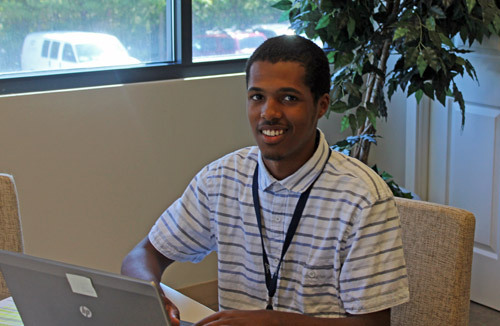 We value the energy and infectious enthusiasm that our interns bring to Peabody Properties and know how important it is for young people like Marcel to gain real-world insights. We are committed to expanding our internship program so that students can learn, lead and grow,” said Frederick.